Imagine waking up in your private suite in Londolozi Tree Camp, strolling out onto your balcony that extends into giant treetops, and slipping into your own private cascading plunge pool for a morning swim. All this while you are on the lookout for members of the Big Five who may have wandered down to the watering hole below. An ambiance of African simplicity, without losing any aspect of colonial safari luxury is precisely what Londolozi Tree Camp wishes to offer their guests at the camp. This camp is indeed changing the way people think of wilderness retreats. Three of the six suites at Londolozi Tree Camp extend into the treetops via a short private walkway. All of the suites have en-suite bathrooms or you can also experience an outdoor shower overlooking the Sand River. Outdoor showers overlooking the Sand River, an authentic African boma and delicious pan-African cuisine make this one of the most popular and enjoyable private game lodges in Africa. Elevated suites, some of which extend out onto elevated decks nestled in the treetops, make Londolozi Tree Camp a stunning and unique African game viewing experience. This is truly going to be a life-changing experience with so much on offer. End off a busy day out in the bush with a candle-lit bush dinner, where the pan-African flavors of fine cuisine will tempt your pallet and the sounds of the African night will fill the air around you or enjoy the authentic atmosphere while dining in the camp’s African boma. These experience are exactly what makes this one of the most popular and enjoyable private game lodges in Africa. Londolozi reserve, a private reserve inside the Sabi Sands Private Game Reserve, has its roots in the rich history dating back to 1926, and still owned by the same founding family. This adds to the hospitable atmosphere at all the camps ensuring that guests are treated intimately. As the first game reserve in the world to obtain the Relais & Chateaux status, this is a highly acclaimed accreditation recognizing their contribution and commitment to providing luxurious accommodation, fine cuisine, and outstanding service. Your days will be occupied by a magnitude of activities, and of course, excellent game viewing in open Land Rovers. The experienced rangers will ensure that you get the most out of your twice-daily trips that are perfectly complimented with bird watching and stargazing. 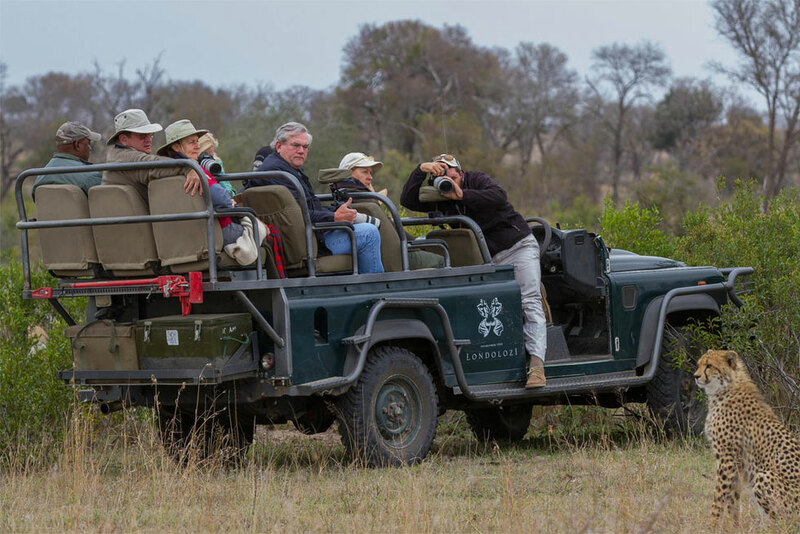 For the safari explorer enthusiasts, Londolozi offers guided nature walks giving you a wonderful experience to reconnect with nature. The interpretive center is also well worth a visit and you are invited to attend the bush presentations on offer or to take a cultural visit to local Shangaan Village. Want to see Londolozi Tree Camp as part of a trip? Enquire today to let us help build your holiday.